The Ford Fiesta is one of today's most popular subcompact cars, offering exceptional value and a wide range of options to meet your individualized needs. 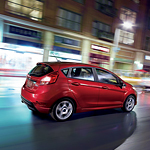 At Bergey's Ford of Ambler, we offer all of the Fiesta's trim lines, so you can choose whether you're looking for an entry-level vehicle, a well-equipped option or an exciting sporty ride. Whichever you choose, you'll have even more options to allow you to highlight your personal style. With 10 different exterior color options, you can find just the right look to catch eyes as you drive down the streets. The Fiesta's brilliant color options include Bohai Mint, Lightning Blue and a range of premium metallic paints. Your Fiesta's wheels can also show off your individual taste. Offered in a range of materials, styles and sizes, you can find the wheels and rims that give you the look and the drive you desire.